You can find many Pikachu living in the heavy forest and mountainous areas. Pikachu are short little mouse-like Pokémon that are usually found with yellow fur and have black tips on the end of their long ears. 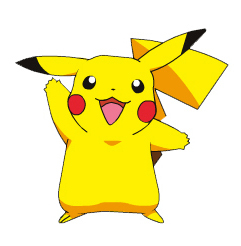 You'll also find brown stripes or markings on the back sides of most Pikachu Pokémon, with red circles on there cheeks. That's where they generate their electric charges from. Using this method, Pikachu are able to render powerful attacks on their unsuspecting opponents. Pikachu is numbered #25 in the National Pokédex. Alot of times, they tend to gather around in areas with large thunderstorm activity such as power plants or stations. The Pikachu themselves are able to generate electric sparks from there cheeks simply by squeezing them. Since the beginning of the Pokémon series, Ash Ketchum chose Pikachu to be his first Pokemon that he would take care of and train. They've been together ever since. Pikachu is what many consider to be the best overall Pokémon ever.